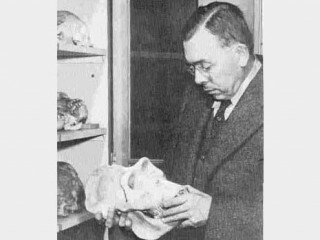 Earnest Albert Hooton was an American physical anthropologist known for his work on racial classification. Hooton conducted detailed research on physical and racial characteristics, and used his data to develop wide-reaching analyses of the racial components of American Indians and, more controversially, to attempt to characterize the physical attributes of criminals. While his efforts to connect the external, physical form of people to their internal personality or character had some merit, his simplistic extrapolation to actual behavior was methodologically and logistically flawed. * Hooton, Earnest A. 1916. The Relation of Physical Anthropology to Medical Science. s.n. * Hooton, Earnest A. 1946. Up from the Ape. Macmillan Company. * Hooton, Earnest A. 1970. Apes, Men and Morons. Ayer Co Publ. * Hooton, Earnest A. 1939a. The American Criminal. Cambridge: Harvard University Press. * Hooton, Earnest A. 1939b. Twilight of Man. G.P. Putnam's Sons. * Hooton, Earnest A. 1945. A Survey in Seating. Olympic Marketing Corp.
* Hooton, Earnest A. 1941. Why Men Behave like Apes, and Vice Versa; or, Body and Behavior. H. Milford. Oxford University Press. * Hooton, Earnest A. 1942. Man's Poor Relations. Doubleday, Doran & Company.